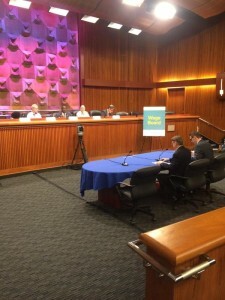 ALBANY, NY – Today, former New York State Senator Terry Gipson (D-Hudson Valley) testified before the state’s Fast Food Wage Board about his life experiences as a minimum wage worker and the importance of an increase in the minimum wage in the fast food industry and for all workers in New York State. Good morning. My name is Terry Gipson. 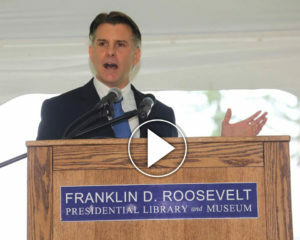 I am a former State Senator from the Hudson Valley. Thank you for holding this important public hearing, and thanks for the opportunity to share my concerns with you today. There was a time when a high school graduate could work hard at a minimum wage job and make enough money to buy a used car, rent an apartment with roommates, buy groceries, and help pay for their college tuition. I know that these times used to exist because I lived them, my friends lived them, and millions of Americans used to live them. In fact, it was by mopping floors, flipping burgers and washing dishes at minimum wage jobs in the food industry and other jobs that helped get me through college, earn two degrees, and put me on the path to building a successful business career. This was not an unusual story for anyone that was willing to work hard. That’s because the minimum wage used to be set at a rate that was more comparable to the cost of living than it is today. It still wasn’t easy but we got by, and we were able to move up the career ladder much faster than is possible for most young people today. It’s unfortunate that today’s hearing is focused solely on fast food workers when the economic facts clearly show that workers in all industries are suffering from the effects of low wages. Many of the individuals that serve you at McDonalds and Burger King are working on dangerously low levels of sleep because they work two or more jobs. Many of the workers that cook your food at Taco Bell and Wendy’s are malnourished and unhealthy because they don’t make enough money to buy healthy food, let alone have time to go grocery shopping. And don’t forget about those workers that get you your morning coffee at Dunkin Donuts. Even if they had time to get to the grocery store, they may not have a car or access to transportation to get them there because they just can’t afford it. And, as good jobs continue to be hard to find, more and more older adults are turning to fast food and other minimum wage jobs — just to survive. Fast food, for better or worse, has become a major part of our daily lives, and it is one of the largest employers of the young adults that we are counting on to become responsible parents, doctors, teachers, engineers, business leaders, and the community and government leaders of our future. How can they possibly meet our expectations if they can’t afford to go to college, buy a car, rent an apartment or buy healthy food? How can we possibly expect our young adults to lead our country to a successful tomorrow if we continue to keep them living in poverty today? I want to thank you again for holding this hearing, and I thank Governor Cuomo for convening this Commission. You have been given an opportunity to make a big difference in the lives of many people, and have an even bigger opportunity to help us build a strong economy that works for everyone. It is my hope that you will raise the minimum wage for not just Fast Food workers, but for every person that gets up every day and puts in a full day of hard work. The goal today is clear — no New Yorker who works full-time, pays their taxes, and contributes to our society should still be living below the poverty line. We all deserve an opportunity, like I had, to improve our standing in life.